THURSDAY, May 29, 2014 (HealthDay News) -- When you have high blood pressure, exactly what type of increased heart risk you face may be determined by which number in your blood pressure reading is high, new research shows. In a blood pressure reading, systolic pressure is the top number and diastolic pressure is the bottom number. People with higher systolic blood pressure had a greater risk of bleeding strokes and stable angina (chest pain), while those with higher diastolic blood pressure were more likely to be diagnosed with an abdominal aortic aneurysm. An abdominal aortic aneurysm is an overstretched, weakened section in the body's main artery, that occurs in the belly. If it bursts, it can cause serious bleeding and even death. To reach their conclusion, researchers analyzed the health records of more than 1 million people in England who were aged 30 and older and who did not have heart disease. They were followed for an average of 5.2 years. The study, published in the May 29 issue of The Lancet, will be presented at the Hypertension 2014 meeting in Athens in June. 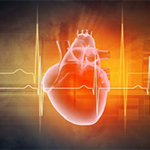 "Our findings do not support the widely held assumptions that systolic and diastolic pressure have similar strong associations with the occurrence of all cardiovascular [heart] diseases across a wide age range," lead investigator Dr. Eleni Rapsomaniki, from The Farr Institute for Health Informatics Research in London, England, said in a journal news release. The researchers also found that despite modern medications, people with high blood pressure, or "hypertension," still face greater lifetime health risks. For example, a 30-year-old with high blood pressure has a 63 percent lifetime risk of developing heart disease, compared with 46 percent for a person with normal blood pressure. Also, someone with high blood pressure would typically develop heart disease five years sooner than someone with normal blood pressure, the study authors noted. "With lifetime risks this high, the need for new blood pressure-lowering strategies is paramount," Rapsomaniki said in the news release. "Our estimates provide vital new information that can be used to improve patient counseling and decision-making for people with hypertension, which are currently based mainly on the risks of heart attack and stroke, and will help to focus guidelines and doctors to the cardiovascular conditions that might be more common, and in which screening and treatments are more likely to have an effect," Rapsomaniki added. In a commentary accompanying the study, Thomas Kahan, from the Karolinska Institute in Stockholm, said that although the effectiveness of blood pressure-lowering drugs is undisputed, "observational studies suggest that few patients reach target blood pressure. Several steps therefore need to be taken to improve antihypertensive treatment and control." Those steps include assessing patients' heart risks more carefully, pushing patients to stick with their medication schedules, expanding the use of home blood pressure monitoring and more aggressive treatment of those with tough-to-treat high blood pressure.